Announced by Prime Minister Narendra Modi, Ayushman Bharat scheme offers free health insurance of upto ₹5 lakh but you have to check whether you are eligibility or not. During his Independence Day speech from Red Fort, Prime Minister Narendra Modi today announced that Pradhan Mantri Jan Arogya Abhiyaan, also known as Ayushman Bharat or the National Health Protection Mission (AB-NHPM) or Modicare, will be launched on 25 September. The government-sponsored health insurance scheme will provide free coverage of upto ₹ 5 lakh per family per year at any government or even empanelled private hospitals all over India. However, since the scheme is meant only for poor and economically-deprived people, not everyone is eligible to get free medical insurance under Ayushman Bharat scheme. Modicare will be available for 10.74 crore beneficiary families and about 50 crore Indian citizens. 1. Once rolled out across the country, Ayushman Bharat will provide a cover of ₹ 5 lakhs per family per year for secondary and tertiary medical care facilities. 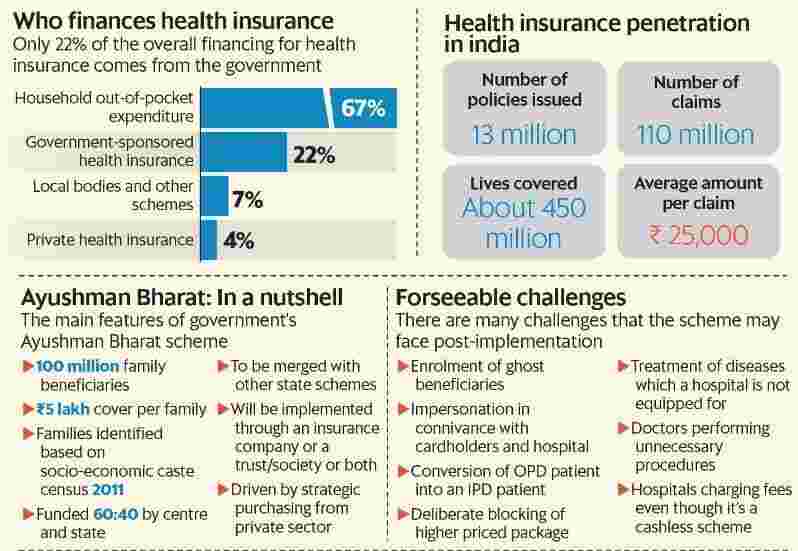 Also read: Can Ayushman Bharat alter India’s healthcare landscape? 4. Ayushman Bharat is unlike other medical insurance schemes where there is a waiting period for pre-existing diseases. All kinds of diseases are covered from day one of the Ayushman Bharat policy. The benefit cover includes both pre and post hospitalization expenses. 5. Having an Aadhaar card is not mandatory to avail of Ayushman Bharat benefit but beneficiaries need to carry a prescribed ID to receive free treatment at the hospital. 1.Families living in only one room with “kuchcha walls and kuchcha roof"